But they’re OK. They sink into a lower metabolic state when it gets cold and stick their snouts out of icy ponds to continue breathing. In Atlas Obscura, we find that Asheville, NC has a lot of very large urban wildlife, and the experts (of course!) are studying the issue of just how many bears can live in the city. When we talk about urban wildlife, we’re usually referring to small, deft creatures—squirrels, pigeons, or other standbys that mind their own business and fade into the background. Your average city-dweller might catch a deer in their headlights every once in a while, or spot a raccoon digging through the trash. A bear is something of a different story. A male can weigh 600 pounds. That’s not the kind of creature you get used to seeing on your commute. Somewhere around 8,000 black bears range around western North Carolina, and many of those make Asheville itself part of their meandering. 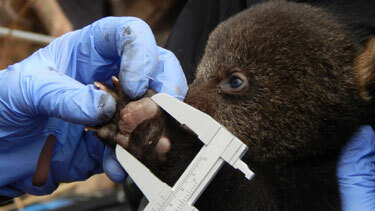 According to the Urban-Suburban Bear Study, an ongoing project by the state’s Wildlife Resources Commission and North Carolina State University, these bears are very healthy, often well-fed enough to have twice as many cubs as your average scrappy mountain bear, and confident enough to den right outside of town. After a couple of years of study, the researchers—along with most of Asheville’s humans—are wondering exactly how many bears the city can hold. The democrats are probably working on registering the bears to vote. 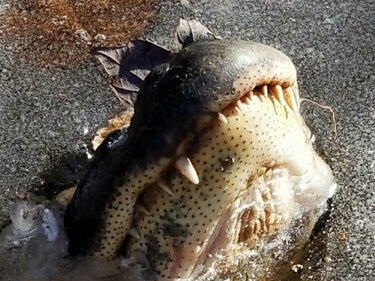 The Guardian has news of the discovery of a very large, bipedal crocodile which once inhabited the Carolinas. Scientists have unearthed fossils in the United States of a big land-dwelling crocodile that lived about 231 million years ago, walked on its hind legs and was a top land predator right before the first dinosaurs appeared. Transported back to the Triassic Period, what would a person experience upon encountering this agile, roughly 9-foot-long (about 3 meter-long), 5-foot-tall (about 1.5 meter-tall) beast with a long skull and blade-like teeth? “Abject terror,” said North Carolina State University paleontologist Lindsay Zanno, who led the research published in the journal Scientific Reports. “Climb up the nearest tree,” advised North Carolina Museum of Natural Sciences paleontologist Vince Schneider. The creature is named Carnufex carolinensis, meaning “Carolina butcher,” for its menacing features. 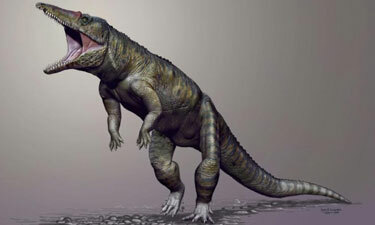 It was a very early member of the crocodile lineage and was unlike today’s beasts. It was not aquatic and not a quadruped, instead prowling on two legs in the warm equatorial region that North Carolina was at the time. 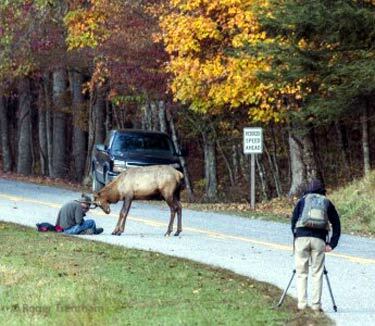 You recall that young bull elk, who was photographed beating up on a photographer in the Great Smoky Mountains National Park last month? There is also a video of the encounter. Watching the video, it seems clear that the photographer could have stood up and, at least briefly thereby, frightened off the elk, and he would very probably then have had time to scurry off and take shelter in one of the nearby cars. It also seemed clear to me that the young elk was frequently very close to starting a really thorough hoof-stomping, antler-poking display of power. The Park Service restored a herd of elk in 2001 to the Catalochee Valley in the Great Smoky Mountains National Park. Last month, a young bull elk, inflamed by the rut, decided to treat a human photographer as a rival for female elks’ affections. Movement caught my attention to my right and there sitting on the pavement about seventy-five yards up the road from me was a spike elk sparring with a photographer. The spike had apparently come out of the woods behind the man and wanted to do a little sparring. I turned my camera and began recording the session. The man lowered his head to avoid eye contact and covered his face with his arms while the spike placed the crown of his head between his antlers against the man’s head and began turning back and forth. The man protected himself as best he could with his arms while clutching his camera and this went on for several minutes. Each time the spike stopped and backed up a few steps the man would look up and the spike would begin again. The man did not appear to be suffering injuries but the spike would not stop. Finally, a white car approached and turned toward the spike who backed up just long enough for the man to rise to his feet. When the man got up the spike moved toward him and lowered his head like he would charge. The driver of the car approached the spike closer and the man was able to get in the car. Yes. Some years ago, Karen and I saw California idiots trying to pet a female Roosevelt elk from the Elk Meadows herd near Orick, California. As the human family advanced, the elk looked more and more alarmed, and it was easy to see that if that elk ever decided she was cornered, she was going to stomp or kick some of the offending humans good and proper. Fortunately for them, the elk found herself an exit from the crowd closing in on her, and trotted away. But there was certainly a real possibility for someone to have seriously hurt. The New York Daily News has the story of a young girl, abandoned by her parents, indigent, who slept on friends’ couches and worked part-time jobs to survive. She was never trained in personal hygiene or social conventions by anyone, wore the same dress for months at a time, and was forced to transfer to six different schools. She worked a job as a janitor in her high school but nonetheless got straight A’s. It doesn’t take a village. It takes personal determination and drive. A 17-year-old star student in Sanford, North Carolina was searched, then suspended, arrested and charged with a misdemeanor, because she was mistakenly carrying her father’s lunchbox, identical to her own, and his contained a small paring knife which he used to slice his apple. It is time for the revolution. America has somehow wound up being run by nincompoops who respond to unique and extraordinary crimes committed by a few individuals (Columbine, 9/11) by awarding themselves unprecedented grants of authority, completely alien to our constitutional and civic traditions, to tyrannize over the entire American population. Americans are now harassed, electronically strip-searched, and groped at airports, treated like criminals upon entering courthouses and public offices, and children are arrested and thrown out of school for drawings, carrying toys, or for being found in possession of kitchen utensils. Not so very long ago, high school boys used to participate in target shooting in urban high schools. Rural students would bring deer rifles to school, and keep them in the lockers during class, in order to go hunting at the end of the school day. Only someone genuinely insane would suppose that Ashley Smithwick really represented a threat to anyone, but an ideological regime pathologically hostile to private possession of arms and fanatically devoted to the principle of a statist monopoly of force has descended upon schools across the United States. Zero tolerance policies are gestural expressions of ideological absolutism. Zero tolerance policies express the viewpoint of officialdom that our pacifistic, hoplophobic values are more important than facts, rationality, or your rights. Nothing whatsoever is as valuable as physical safety and the unchallenged rule of established authority. Totalitarianism never came to America through foreign invasion, military conquest, or our defeat by foreign enemies. But totalitarianism has arrived here, in our schools, our airports, and our public spaces, entirely domestically. Totalitarianism is already occupying ever-expanding regions of our public lives via the petty tyranny, the habitual cowardice, the overwheening self-importance, the small mindedness,and the contemptible values of our ordinary administrators and minor officials. This country needs a new litigation center dedicated to combating zero tolerance policies, safety fascism, and TSA-style security policies. Update from Bryan Preston via Glenn Reynolds. The school administrators are issuing misleading press releases, obfuscating the student victim’s status and trying to depict a new-fangled lunch container as a purse. Sleazoids. 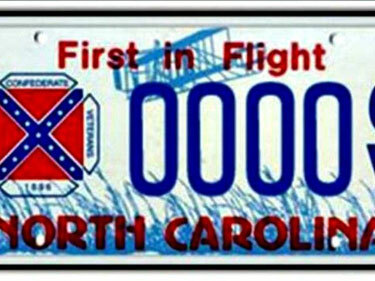 Originally mistakenly tagged “South Carolina” by a blind and incompetent editor. the Archives of Never Yet Melted in the 'North Carolina' Category.